One type of foundation for many types of buildings or garages is a slab foundation. Slabs are susceptible to problems when voids open beneath them. This can occur when the ground beneath the slab is poorly compacted or made up of soluble soil. If there are spaces or voids beneath the slab it can begin to shift which can lead to concrete cracking, sinking, and settlement. Polyjacking.com uses Ground Penetrating Radar (GPR) for void detection. There are ways to help prevent slab issues from getting worse, so if you notice cracks in your slab or if your slab seems uneven, it is time to call Polyjacking.com for assistance. 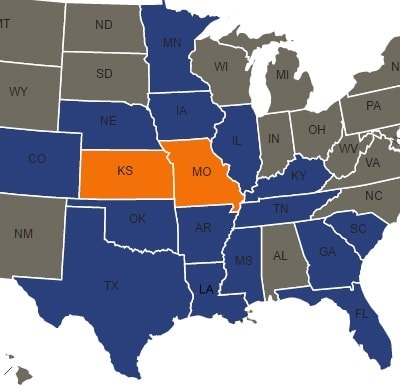 We proudly serve St. Louis, MO, and also Kansas City, MO for all their slab lifting and leveling needs, as well as much of the rest of the country. Check out our service area or give us a call if you need assistance. Drilling: A small 5/8" hole is drilled through the affected area. Injection Process: With our specialized system, the polyurethane foam is injected into the void that is beneath your floor. This foam will expand to fill the entire void. This will raise your floor back to its original level. Hole Filling: After the injection is completed, the holes are filled and the site cleaned up. Unlike mudjacking, polyurethane foam has a short hardening time so your floor is ready about 15 minutes after injection. We make it a priority to leave your property in as good as condition as we found it, and we work very hard not to disturb surrounding areas and landscaping as little as possible. We serve everyone from residential properties to larger industrial and commercial properties. If you have a slab problem, or are in need of concrete repair in Kansas City, MO or the surrounding area, count on the concrete experts to repair, lift, and level your concrete slab. Contact us today!